It was a little bit of history, some grand landscapes and superb wildlife from Pam and Eddy Lane last night with their fascinating presentation In the Footsteps of Shackleton. Pam and Eddy, both ARPS, DPAGB and EPIAP, kept us riveted with the stories and images from their trips following the route taken by Shackleton in 1914 – 1916. There were of course a fair number of penguins and Eddy and Pam’s enjoyment of these engaging creatures came across very clearly! 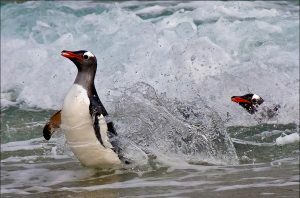 Along with many other wonderful wildlife images, Eddy’s retelling of how these images were captured, the insight to the whaling past of the region and the glimpse into the old British Antarctic Expedition hut (custard anyone?) made for a great evening. 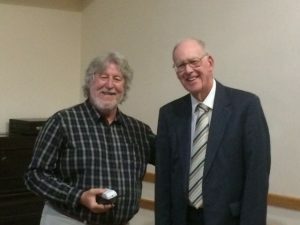 Our vote of thanks was to have been given by Dave Abbott, who had been felled by a heavy cold, but we were very pleased to have Club Vice President Patrick Pead with us, and Patrick stepped in to give a heart felt vote of thanks for a most enjoyable and informative presentation. We also heard that the Selection Committee had spent two whole days going through hundreds of images for external competitions. It was quite a task with so many good images to go through, but all Members whose work has been selected will now have been told, and as soon as the images have been uploaded to the external competitions we will be able to publish the lists of selected images. In the meantime, work not selected this time is now ready to be collected. We also congratulated Glyn Edmunds not just for the excellent programme we have enjoyed so far this year, but on his recent news that he has been made an Honorary Member of Southampton Camera Club in recognition of his considerable contribution to the Southampton International Exhibition over many years. Well done Glyn!